Platforms—a dozen massive ones, and perhaps 500 smaller ones—play an increasingly critical role in the livelihoods of hundreds of millions of people around the world. In almost every economic sector, platforms have introduced new “multi-sided” markets, matching buyers and sellers in attention, goods, services, and labor at massive scales. Websites and electronic supply chains are replacing bazaars and storefronts. Gig work is augmenting salaried work. Algorithms and finely-tuned digital user experiences are supercharging traditional buyer/seller relationships. Platformization will transform markets and livelihoods everywhere, but perhaps nowhere more so than Africa, where there is an urgent need—and a unique opportunity—to provide new forms of livelihoods to a young, growing population eager for better access to dignified work. In this project of the Mastercard Partnership for Finance in a Digital Africa (FiDA), we seek to improve the relationships between platforms and sellers—the small-scale producers, the self-employed, and the gig workers that rely on platforms to sell their goods, services, and time. 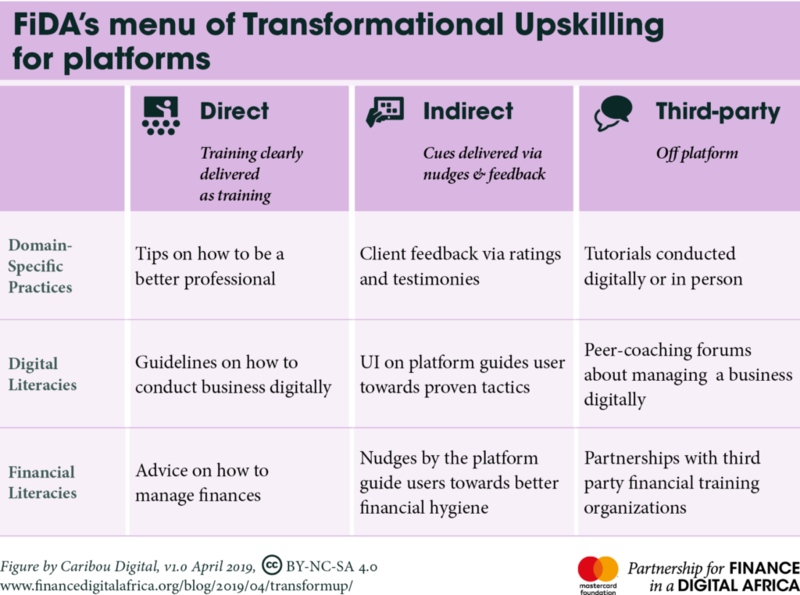 Transformational upskilling allows platforms to prosper by facilitating learning, in win-win-win relationships with participants and labor markets. Platforms win by accelerating sales and increasing the quality of goods and services on offer. Producers win by learning new skills and improving their craft. Regions and countries win by increasing the human capital of their workforce. There is a great deal of training happening on platforms around the world. In regions with high Internet use, Amazon, Facebook, eBay, and other platforms invest considerable resources in training their producers in order to improve the quality and volume of transactions on the platform. In frontier markets, global platforms as well as dozens of regional ones are discovering the best ways to help the digitally nascent become more adept digital producers. These range from Africa’s e-commerce giant, Jumia, which offers financial literacy lessons to help entrepreneurs do their books, and Kenya’s Lynk, which provides training modules to gig-seekers, to the ridesharing platform Bolt (formerly Taxify) that texts the locations where users can maximize their earnings to drivers in 20 African cities. Platforms win by accelerating sales and increasing the quality of goods and services on offer. Training can coach or nudge producers to be more effective, ultimately leading to more sales of higher quality goods and services on the platform. Producers win by learning new skills and improving their craft. Producers can diversify their professional and business skills and thereby keep up with market demands.Cities, regions, and countries win by increasing the human capital of their workforce. Training modules have the potential to transform the workforce towards higher paying digital jobs across cities, regions, and countries. Now. We’re talking to micro-entrepreneurs in Kenya about their platform practices and learning needs. We’re also doing a landscape of the best practices in transformational upskilling. Soon. We’ll be working directly with platforms in Africa to (1) identify their producers’ key learning needs and (2) help delineate specific, cost-effective but high-impact improvements to training that platforms can use to support their users and the economies in which they work. And a bit later. We’ll be inviting more platforms around the world to get involved, sharing best practices about the potential of transformational upskilling, and offering specific toolkits and support to bring more transformational upskilling to more platforms, users, and regions. We’ve observed several types of Transformational Upskilling: Direct Methods deliver training clearly labeled as such (e.g., training videos). Indirect Methods deliver cues through nudges and feedback (e.g., ratings systems). Third-Party Methods arrange or endorse off-platform training with support from the platform (e.g., in-person training with subject-matter experts). We’ve also distinguished three primary content areas where platforms upskill producers: Domain-Specific Practices (i.e., how to be a better professional); Digital Literacies (e.g., what makes a successful e-commerce advertisement); and Financial Literacies (e.g., tips on how to manage finances as a freelancer). Combined, these two classifications offer a “menu” of Transformational Upskilling opportunities. Community of practice: We want to create a center of excellence on Transformational Upskilling, covering different focus areas (social media, e-commerce, online work) across the globe by finding the best examples of Transformational Upskilling and champions who can evangelize its value. Consultative engagement: We’re also interested in identifying a couple platforms to work directly alongside us in research with small scale producers or self-employed workers, to expand learning opportunities within digitizing markets around the world. Do you want to be a part of the community of practice, or the research engagements, or both? Do you have feedback, or examples of transformational upskilling you’d like to share? Please send an email to ideas@financedigitalafrica.org to let us know! And in the meantime, be sure to watch for further updates from the FiDA team as our research unfolds.